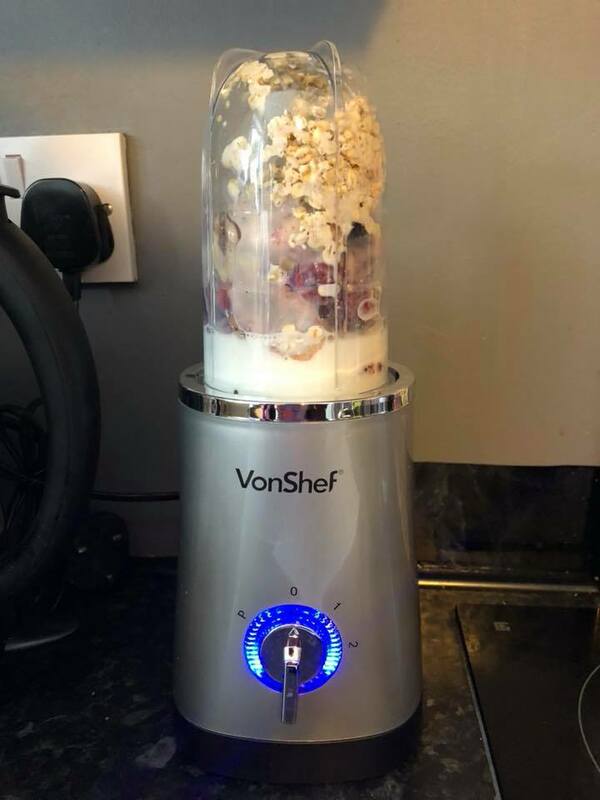 With my recent health kick and the death of the blender that attaches to my food mixer I’ve been struggling when it comes to blitzing stuff. Cauliflower rice, for example doesn’t work with a stick blender. 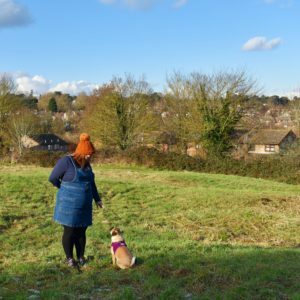 Me, the dog and the whole kitchen ended up covered in smelly cauli-snow. Yuk. 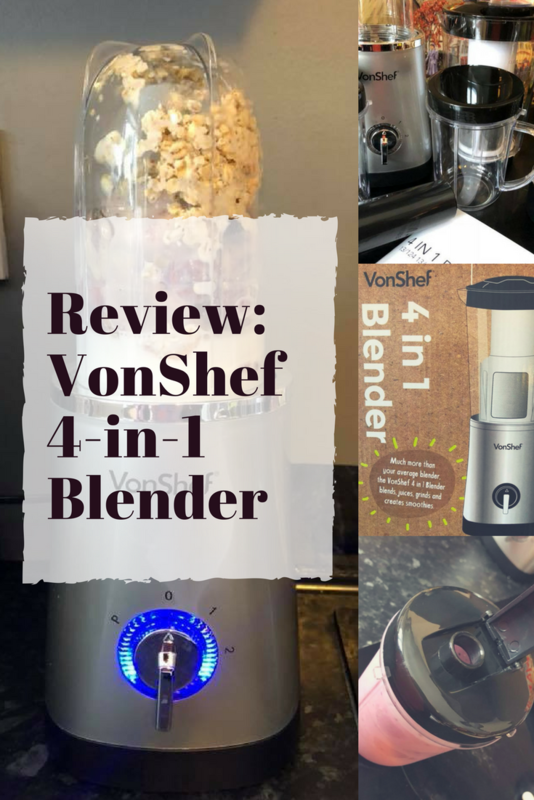 And so when I was offered the chance to review a VonShef 4 in 1 Blender from DOMU, I jumped at the chance. 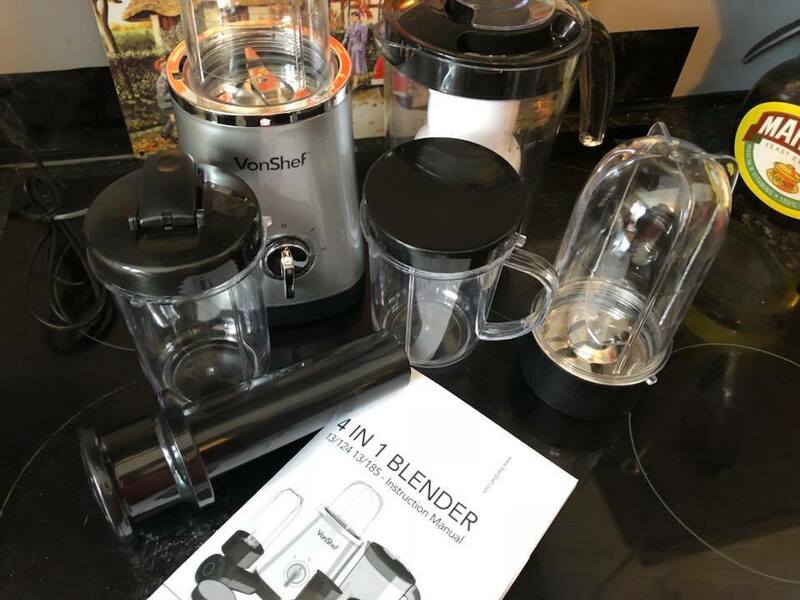 This particular model does all sorts – it blends, juices, grinds(coffee beans, nuts for pesto) and makes smoothies. 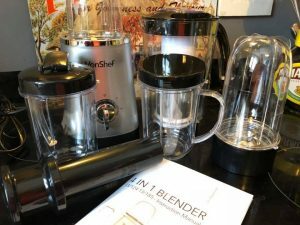 I blend a lot – sauces, soups etc. so I was excited to try it. 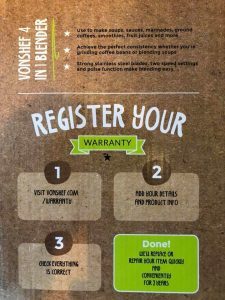 The packaging is nice on the eyes which is nice, and also explains how to register for the two year warranty – another bonus when my current blender died just over a year out of warranty. 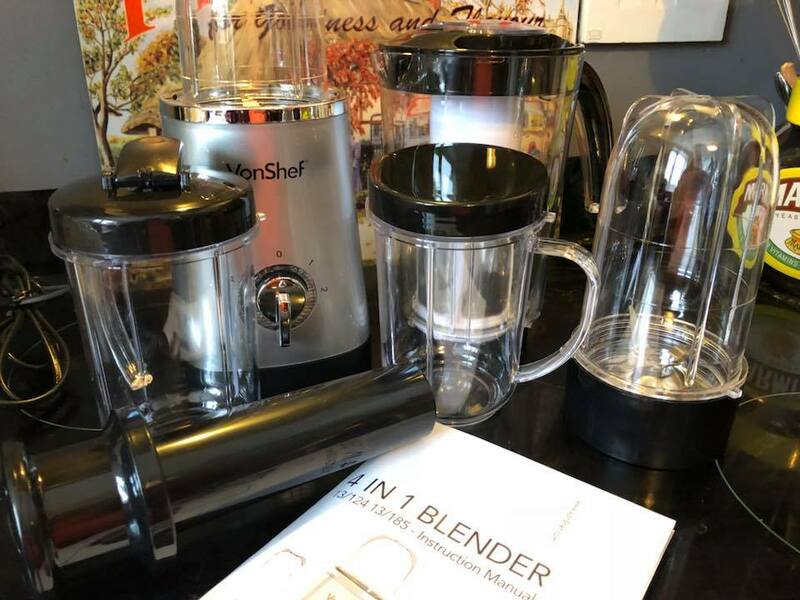 This model comes with quite a few accessories – there are two different blades, a juicing component, cups and lids, and the base unit itself is nice and compact. 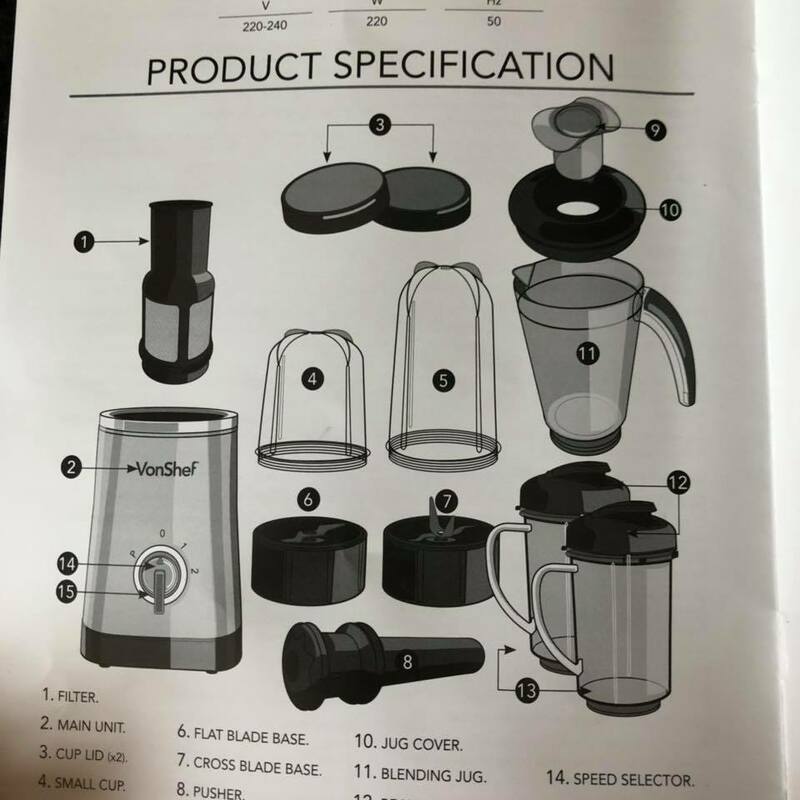 It has a large 1.5l blender with 1l capacity, 1l smoothie maker jug and two 5ml mugs, so lots of options. 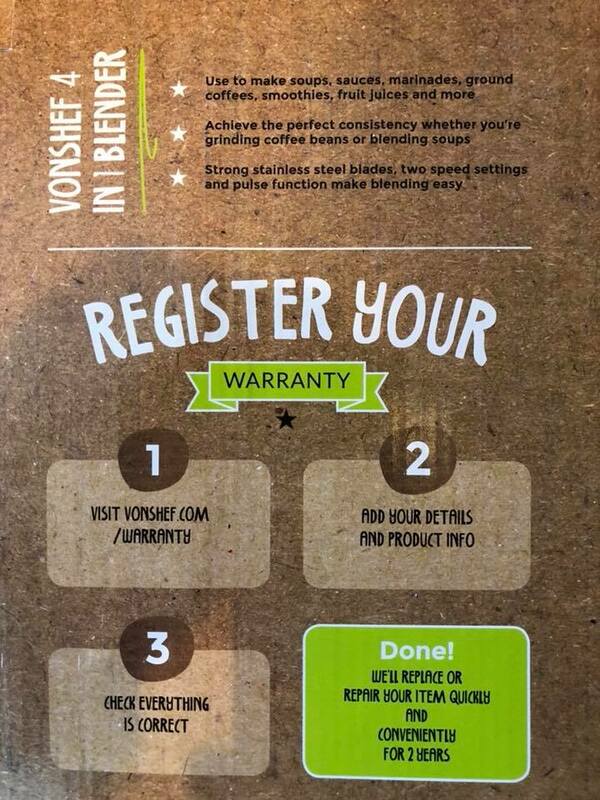 It is also BPA-free, and easy to wipe down. 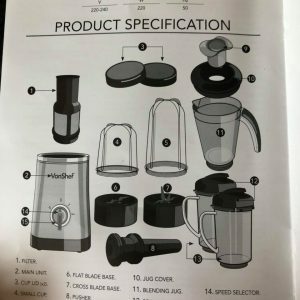 The instructions were awesome – I wouldn’t normally get excited about such a thing but they were so clear and informative with recipes in the back. I’ll admit when I opened the box I was slightly overwhelmed and confused by the amount of bits but the instructions were so easy to follow this really wasn’t an issue. 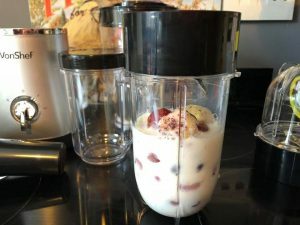 The base itself has a pulse function plus two speeds, and I tested it out by making a smoothie. It is worth nothing that frozen fruit isn’t recommended, but I did blitz a couple of frozen berries and it seemed to have no problems. DOMU have a range of products for making smoothies, which you can check out here. I loved that it was really safe to use – I’m terrible for cutting myself and the cups and lids and ease of use and cleaning meant that there was little risk of injury. Talking of cleaning – rinse under a tap, dunk in soapy water, clean in seconds – no complicated nooks and crannies to spend ages trying to clean. It wasn’t too loud either – it did get warm but from past experience it only takes seconds to blitz ingredients and so common sense tells me that you wouldn’t run it for long, plus it does have an auto shut-off feature to prevent overheating. I am also pleased to report that it blitzed my cauliflower like a dream – no cauli-explosions this time. And it blitzed nice and smoothly, too – no lumps. Overall I would recommend this – it fits nicely in my tiny kitchen, does exactly what I need it to do and is price at £29.99(March 2018), a bargain when I’ve spent double that before.